Below is a list of pens styles that we currently offer. 1) Select the plating of the hardware you desire for the specific pen or pencil. 2) Select the type of wood you want from the drop down menu or select "other" and specify in the special instruction at the time of checkout. If you aren't sure what type of wood you would like, you can see some examples in the Material Options page. If you need help you can always email us. 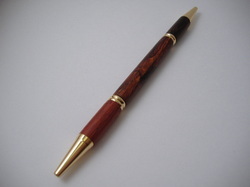 In our opinion you can never go wrong with Cocobolo! Add a style to the top of your slimline pen for just $5 more! This large, bold, ball point pen will make a powerful statement with its size. Great for those that like larger size pens or those that need extra room to engrave a custom logo. 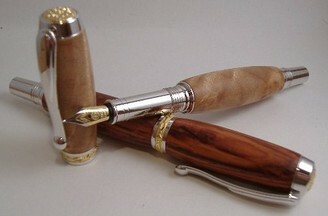 This is a modified Sumo pen created in Walnut burl with a closed end giving the pen a striking resemblance to a cigar. We will add your cigar band to the pen, giving the pen a personal touch and a great way to save bands from your favorite or most memorable cigars. Impressive, robust and easy to grip and click. It features a wide rubber grip, convenient click mechanism, smooth gel refill and chrome plating. Also available is a smaller Turbo Mini pen. This is a slimline pen with an extra twist. One end writes in black, tipped with a black or dark wood, and the other end in red, tipped with a red colored wood. You chose the wood type for the center section. A great gift for your favorite teacher. 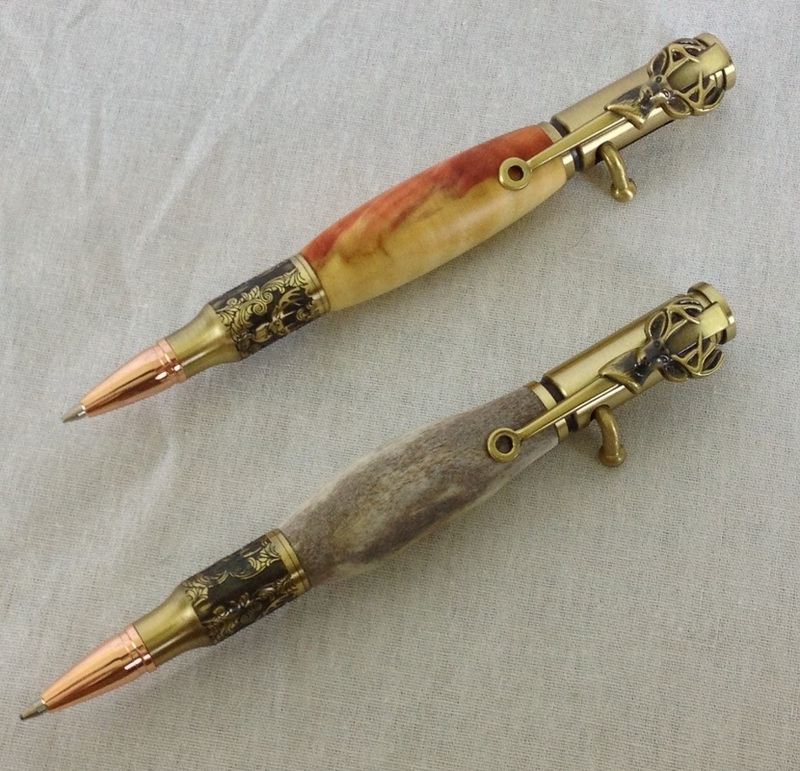 The unique pen features a brass finish and a simulated 45 caliber bullet at the front. The back of the pen has a clip that looks like a slide of a 45 and the upper barrel around the clip has a checkering similar to the grip typically found on 45's. A great gift for any 1911 owner or gun enthusiast. These unique pens add a fun twist to the average click pen. Instead of clicking, you operate it by lever action, just like a traditional lever action rifle. The hardware is finished in antique brass and features some beautiful 3D engraved details. These pens take standard Parker style refills. Unique bolt action style pen with brass finish and rose gold tip simulate the look of a 30 caliber round. With excellent details, a fun bolt action mechanism, a deer mount on the clip, and deer engraving near the tip this pen makes a great gift for any hunter. Made with your choice of wood or deer antler. Unique bolt action style pen with brass finish and rose gold tip simulate the look of a 30 caliber round. With excellent details, a fun bolt action mechanism, and a rifle on the clip this pen makes a great gift. Made with your choice of wood or deer antler. This sketch pencil is a beautiful yet strong writing instrument. The pencil uses a 5.6mm pencil lead and also comes with a mini pen insert. With this "combo" insert you simply pop out the lead and pop in the pen insert and your sketch pencil is now a ballpoint pen. Includes a cap with a convenient pencil sharpener. This small, portable pen is great for people on the go. About the size of a credit card, it fits just about anywhere you need it to. Click action for easy one handed use and brilliant chrome finish. This simple, straightforward rollerball pen has a unique magnetic pen cap design that allows you to mount the cap on either end of the pen without tugging or threading. The full size Premium rollerball pen offers exceptional quality and styling. This large pen has a twist off cap that exposes a smooth writing ceramic tipped Schmidt® cartridge. Traditional smooth end cap for a clean look. The Premium Jr Pen includes all of the same features as its counterpart, but slightly thinner with the ability to post the cap onto the back of the pen body. 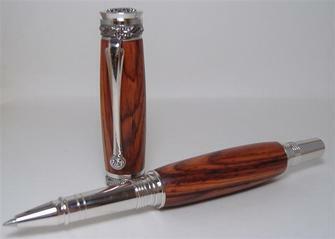 The Regal Series Pen is a full sized pen that includes many elegant features: exposed accent rings, as well as bands and caps with elegant 3 dimensional designs. Components are cast, polished, then plated with extremely durable Black Titanium or 22kt gold and it is accented with brilliant rhodium-plating on all surfaces. Smooth end cap for a clean look. 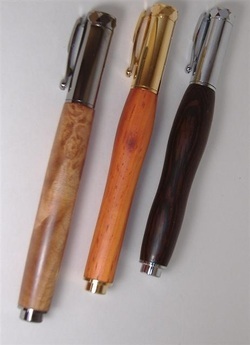 The Regal Jr Pen (shown) includes all of the same features as its bigger brother, only it is slightly thinner and has the ability to post the cap onto the back of the pen body. Our Crystal Series Pen has similar styling and 3D designs to our Regal series above, but also includes a sparkling Swarovski® crystal in the clip. Also has a smooth end cap for a clean look. The Crystal Jr Pen includes all of the same feature as its beautiful relative, it is just slightly thinner and has the ability to post the cap onto the back of the pen body.